Northern Voices: Austerity Kills! Deaths of elderly was 'Gerineglicide' says former NHS consultant.. Austerity Kills! Deaths of elderly was 'Gerineglicide' says former NHS consultant..
A number of studies that have been carried out in recent years have revealed how mortality figures (the death rate), which had been dropping steadily in England since the 1970s, have been reversed since 2011. The studies have also claimed that the reversal in the downward trend in the death rate, is linked to government austerity policies and cuts in public expenditure. In February 2016, the Daily Telegraph disclosed that preliminary data from the Office of National Statistics (ONS), had shown that in just one year (2015), there was a 5.4% increase in deaths in England - equating to almost 30,000 extra deaths. This represented the largest increase in deaths in the post-war period. Public Health England maintained that the 30,000 excess deaths were "not exceptional" and they claimed that the increase in deaths, was due to the influenza strain in 2015 that mainly affected older people. "The impact of cuts resulting from the imposition of austerity on the NHS has been profound. Expenditure has failed to keep pace with demand and the situation has been exacerbated by dramatic reductions in the welfare budget of £16.7 billion and in social care spending." "I suspect that largest factor here is cuts to social services - to meals on wheels, to visits to the elderly. We have seen these changes during a period when the health service is in crisis, while social care services have been cut back." There is growing opinion and evidence that it's the elderly who are bearing the brunt of the cuts to NHS funding and social care. Thousands of complaints have been made about care for the elderly in England. In 2013-14, some 14,888 complaints about care home residents aged 65 and over, were reported to 74 councils. In February 2015, Claire Savage on BBC5 Live, reported that in West Sussex, 19 people died after suffering "sub-optimal care" at the Orchid View care home in Copthorne. The Department of Health, called the abuse and neglect of vulnerable people "deplorable." The neglect of elderly people often results in care home residents being rushed to hospital as emergency admissions. In 2014-15, some 22,682 care home residents were rushed to hospital as emergency cases. This was up from 13,906 in 2010-11, an increase of 63%. Milton Pena, worked in the N.H.S. for forty years before retiring in October 2014. 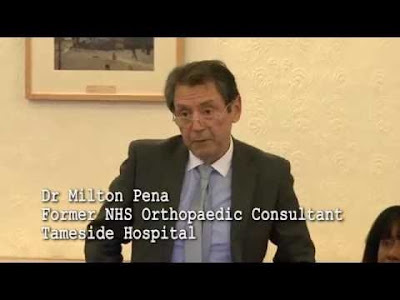 He was a consultant orthopaedic surgeon for 24 years and spent 17 years working at Tameside Hospital. He believes that the most common terminal event that caused the increase in deaths among the elderly population in 2015-2016, was institutional "Neglect!" Indeed, he argues that what was a blip in 2015 - the spike in the mortality rate - has now become a disturbing trend. He said: "The question is not why any particular individual died, but why, after many years of declining mortality, the death rate should increase so much." "There is a mindset among hospital Directors, Business Managers and some health professionals that frail elderly patients are 'not our core business'. Few national providers would make such a blatantly ageist inference that its 'core business' was too tricky to manage, and propose to solve the problem be ceasing to attempt to deal with it." "Gerineglicide is many things: poverty, misguided policies and directives e.g. the avoidance of hospital admissions, abysmal lack of bed capacity for the admission of patients with acute severe life-threatening conditions such as pneumonia etc. Similarly, insufficient staff - nurses, midwives, radiographers, doctors or lack of resources to care for people in their homes. Keeping elderly individuals with multiple ailments alive, does not make business sense to the mandarins that run health care 'planning and execution' in England. Prolonging the lives of the elderly is not profitable." "The Minister will be aware that mortality rates in England and Wales have increased by 5.4% in 2015, the biggest increase in the death rate for decades. She will also be aware that mortality rates have been rising since 2011. Has she done any analysis of what has been behind those trends?" Milton Pena also says that there has been a deafening silence from most of the professional bodies regarding the excess mortality that spiked in 2015. After the financial crisis of 2008, annual funding increases for the NHS fell from 4% a year to below inflation, even as a growing and ageing population increased demand for healthcare. In November 2017, the New Scientist magazine referred to a 'landmark study' by Jonathan Watkins and colleagues of King's College London that found that after controlling for other economic changes, death rates rose after the cuts, especially among the over 65s. The team also found that 120,000 more people died in England between 2010-2017, following funding cuts to the N.H.S. than would have been expected if trends in death rates before the cuts had been maintained. The researchers also said that if this effect continues, a further 75,000 excess deaths could occur by 2020.